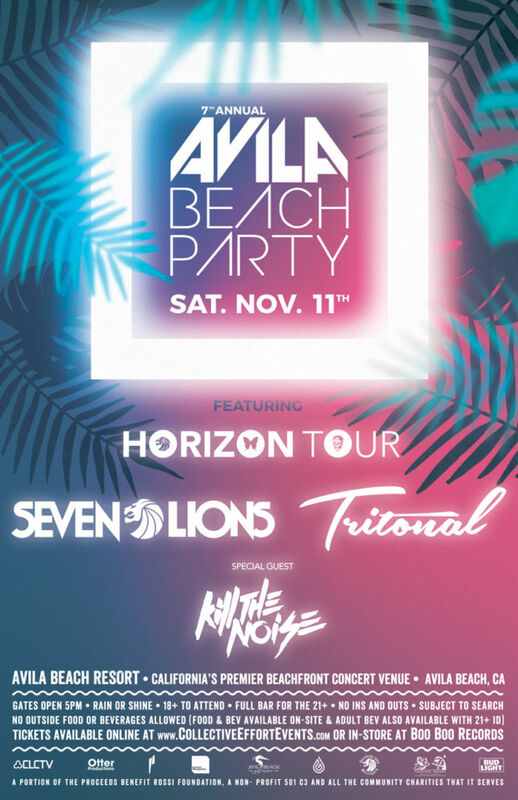 Otter Productions, Inc and Collective Effort Events are teaming up to bring back “The Avila Beach Party” at the beach in Avila on Saturday, November 11th… this year featuring “The Horizon Tour”, with Seven Lions, Tritonal and special guest Kill the Noise. Advance General Admission tickets are on sale now at Boo Boo Records in San Luis Obispo and on line… see the Ticket Purchase button below. Seven Lions is known for transcending musical boundaries to satisfy his creative vision, single-handedly changing the sonic landscape for future generations to come by bridging the gap between the soaring, ethereal vibe of trance and intensely adrenaline boosting bass music. While Tritonal’s evolution and success back from almost 10 years ago when they came together, prove that compelling songwriting, innovative production, and exuberant performances will always resonate with music lovers of all kinds, from underground purists to stadium crowds. And when it comes to the third act, the ‘Special Guest’ – Kill the Noise, who is known to have channeled the influences of his youth by way of Nine Inch Nails & Aphex Twin to name a couple, through over a decade’s worth of forward­-driving electronic releases and charismatic live shows, into creating a name for himself that is synonymous with some of the leading acts in dance music today! We could only leave it to our imagination till a while ago what the awesomeness of a tour featuring Seven Lions, Tritonal AND Kill the Noise could round up to sound like! Three absolutely stellar producers and DJ’s in their own right, these three acts are joining forces for the now highly anticipated ‘Horizon’ North American tour kicking off this Fall! Traversing the continent and pretty much tapping most major cities, the 20-date tour kicks off late in October spanning from Los Angeles to Chicago and Toronto to Las Vegas, among many more. Tickets are $30 – $40 and are on sale now at Boo Boo Records in SLO and on-line at this site. 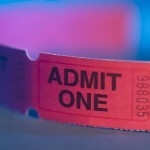 Advance General Admission Tickets on sale now at Boo Boo Records in SLO and on this site.